Molokhia plant growing herbaceous of the genus Corchorus also known as Molokhia, Mloukhiya or Jute, Molokhia annual plant the leaves edible and also used as ornamental plant for fibers or medical plant, can grow in tropic, subtropical, mediterranean or desert climate and growing in hardiness zone 10+ in autumn to spring planting 5-9 as spring planting. Leaves edible leaf color green in elliptic shape with pointed top and serrated margin. Flower color yellow, the flowers small and with five petals and five sepals. 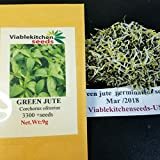 1000 Jute Seeds, Egyptian Spinach, Saluyot, Molokhia, Plant Spring or Summer !